I did it, I showed that white felt who was boss and made a really amazing advent calendar just in time for ... December 3rd! Close enough to the first of the month, right? The process was more complicated and labour intensive than it needed to be, but once I started I was not going to give up. First, I cut out the pockets and decoratively top stitched them before gluing them to the felt base. I carefully glued every (painstakingly) hand-cut number to the pockets and for a finishing touch added my favourite pom-pom fringe in red. Phew, done! Nope, the glue holding the pockets to the base failed so I had to stitch them on, which took hours. 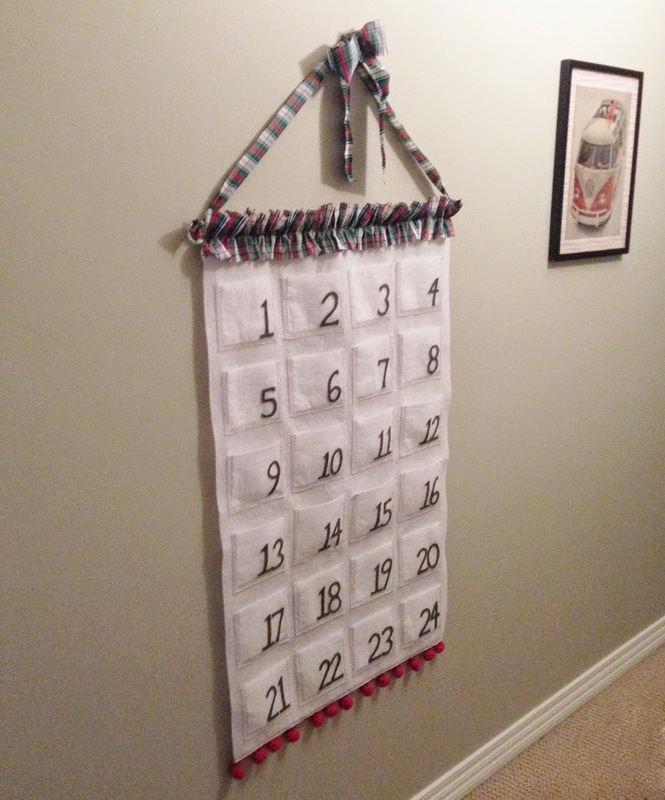 Then the calendar still needed 'something more' so I made a ruffle with a piece of tartan and affixed ribbons to a dowel for hanging. The finished product is just what I had hoped: a lovely keepsake for Eloise and Spencer to enjoy for years. I didn't get as far as organizing what would use to fill each calendar day but I've been able to get by with found objects. Leftover halloween candy filled days three, four, five, a necklace from a recent wedding event was perfect for day six, I went with a candy cane for day seven, a Kinder Surprise snuck into the cart at the grocery store for day eight and Lindt truffles from my personal stash for day nine, ten and eleven. Except Eloise informed me today she doesn't like Lindt truffles... and would prefer Pez. Not up to her, but I also happen to have a Pez refill kicking around so she just might be onto something.